[142 Pages Report] The data masking market was valued at USD 347.3 Million in 2016 and projected to reach USD 767.0 Million by 2022, at a Compound Annual Growth Rate (CAGR) of 14.8%. The major growth drivers of the market include evolving compliance regulations and exploding volume of data. The base year considered for this report is 2016, and the market forecast period is 2017–2022. The main objective of the report is to define, describe, and forecast the global data masking market on the basis of masking type (static and dynamic), component, deployment type, business function, organization size, vertical, and regions. The report provides detailed information regarding the major factors influencing the growth of the market (drivers, restraints, opportunities, and industry-specific challenges). The report aims to strategically analyze micromarkets with respect to individual growth trends, prospects, and contributions to the total market. The report attempts to forecast the market size with respect to 5 main regions, namely, North America, Europe, Asia Pacific (APAC), Middle East and Africa (MEA), and Latin America. The report strategically profiles key players and comprehensively analyzes their core competencies. It also tracks and analyzes competitive developments, such as partnerships, collaborations, and agreements; mergers and acquisitions; new product launches and developments; and Research and Development (R&D) activities in the market. The data masking ecosystem comprises vendors such as IBM Corporation (US), Informatica (US), CA Technologies, Inc (US), Solix Technologies, Inc (US), Innovative Routines International, Inc (US), Oracle Corporation (US), Deplhix (US), MENTIS (US), Micro Focus (US), Compuware Corporation (US), Ekobit d.o.o. (Croatia), and ARCAD Software (France). Other stakeholders of the market include vendors, research organizations, managed service providers, third-party providers, and technology providers. 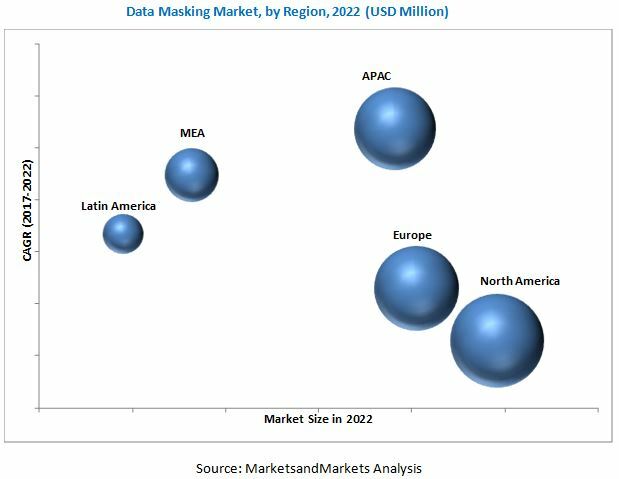 The global data masking market size is expected to grow from USD 384.8 Million in 2017 to USD 767.0 Million by 2022, at a Compound Annual Growth Rate (CAGR) of 14.8%. Evolving business standards and changing regulations and explosion of business data are some of the key factor fueling the growth of the market. The report provides detailed insights into the global data masking market, which is segmented by data masking type, business function, component, deployment type, organization size, industry vertical, and region. In the masking type, the dynamic data masking solution is expected to have a larger market share during the forecast period. With the rise in data volume, need for solutions to protect sensitive data also increases. Furthermore, the flow of data has increased due to IoT and remote sensors across various industries. Companies are focusing on enhancing their software and services that assist them with data masking. Data masking helps in masking data without affecting the content and nature of data, thus mitigating the data related risks. Among organization size, the increasing adoption can be observed by large enterprise, and it is expected to continue its dominance during the forecast period. Whereas, the SMEs segment, with increasing focus on improvement of the customer experience, is likely to have the highest growth rate during the forecast period. The cloud migrations are expected to drive the need for masking data and further drives the adoption in the SMEs segment. The retail and eCommerce is expected to have the largest market share and dominate the market during the forecast period. This upsurge can be attributed to the rise in deployment of POS terminals through which customers’ feedback is taken for better decision-making. Data masking ensures the security of data which minimize frauds and associated risks. The report covers all the major aspects of the data masking market and provides an in-depth analysis for major countries across the regions of North America, Europe, Asia Pacific (APAC), Middle East and Africa (MEA), and Latin America. North America, owing to the early adoption of new and emerging technologies, coupled with expanding data, is expected to continue its dominance in the market throughout the forecast period. The APAC region is expected to grow at the highest CAGR during the forecast period, owing to the increasing data and growing adoption of data management software and services among SMEs. The identification of sensitive data and data integration issues are some of the major challenges faced by the data masking users, which needs to be enhanced to facilitate the adoption of data masking solutions worldwide. The data masking ecosystem comprises vendors such as IBM Corporation (US), Informatica (US), CA Technologies, Inc. (US), Solix Technologies, Inc. (US), Innovative Routines International, Inc. (US), Oracle Corporation (US), Delphix (US), MENTIS (US), Micro Focus (US), Compuware Corporation (US), Ekobit d.o.o. (Croatia), and ARCAD Software (France). Other stakeholders of the market include vendors, research organizations, managed service providers, third-party providers, and technology providers.